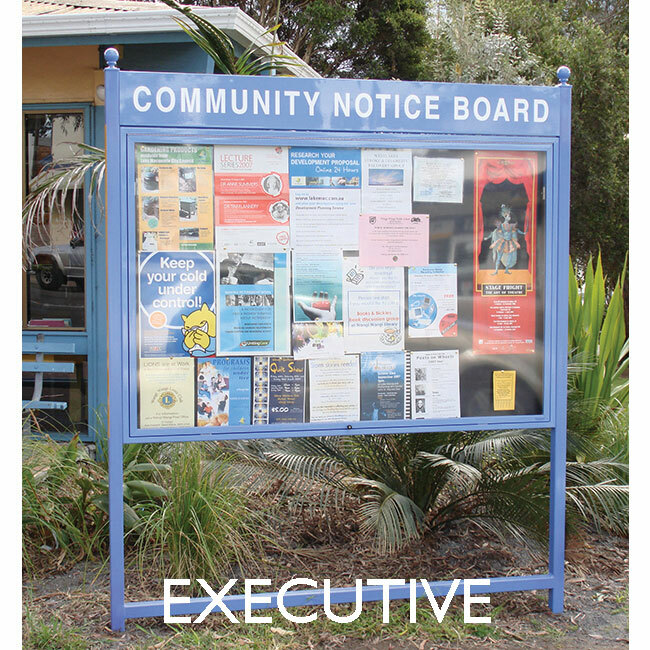 Arrow Alpha offer a range of stands and sign frames for Notice Boards and Poster Cases. 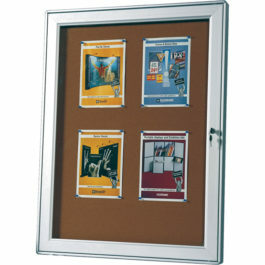 Three types of models are available that suit many of our Notice Boards and Poster Cases. The 3 types are namely; Basic, Executive and Premium. They are all Australia Made with a very high build quality to give a long reliable service life and endure applications with high levels of vandalism and demanding natural environments. 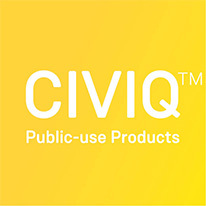 They are very versatile and have a lot of scope for custom made requirements to fulfill all applications and budgets. Included with each is a cross rail near the ground to comply with the Disability Discrimination Act. This can be reposition on site for extra support to sign panels or display cases. Arrow Alpha does not provide or guarantee the professional engineering of the structure, footings and mountings etc required for wind loadings etc for the location the Sign Frame Stands and cases are installed. This is the most economically priced alternative. The posts are behind the case and sign rather than to the side as in the Executive model. This frame is constructed from galvanized steel 50mm square sections x 2.5 and 2.0mm wall thickness. The Basic Stand kit comprises of two 3.0 metre Posts and three Cross Rails up to 2.34 metres each. All lengths are supplied pre made to suit the required size Sign Panel or Display Case. The posts have applicable location cleats fitted for easy on site assemble of the Cross Rails with the supplied tecscrews. This disassembled supply method is to save on handling and freight. Posts install allowance is for 2.4m above ground and standard is 0.6m below ground or alternative an upgrade option of Bolt Bases welded on. Optional is a Standard Sign Header Kit. It comprises of an extra pre made Cross Rail and 195mm high white sign panel with double sided tape attached for fitting to the frame on site. 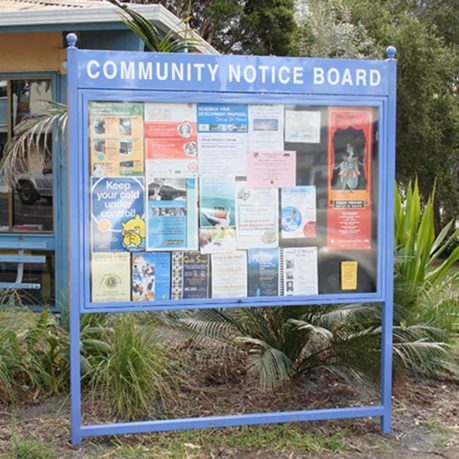 Optional vinyl graphics can also be attached to the sign. 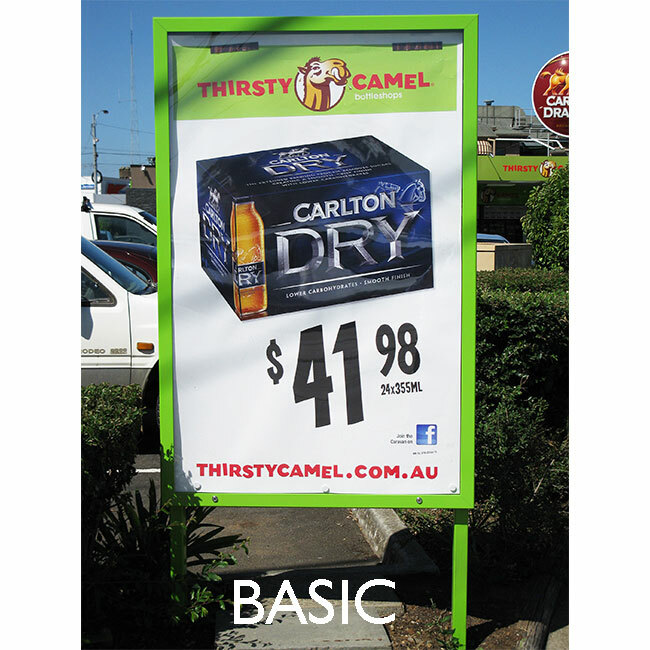 Customised shaped sign panels are also available. The galvanized Stand parts can be further all finished to a selected colour powder coat along with aluminium sign panel/s. The posts are positioned to the side of the case and sign with this model. This frame is constructed from galvanized steel 50mm square sections x 2.5 and 2.0mm wall. 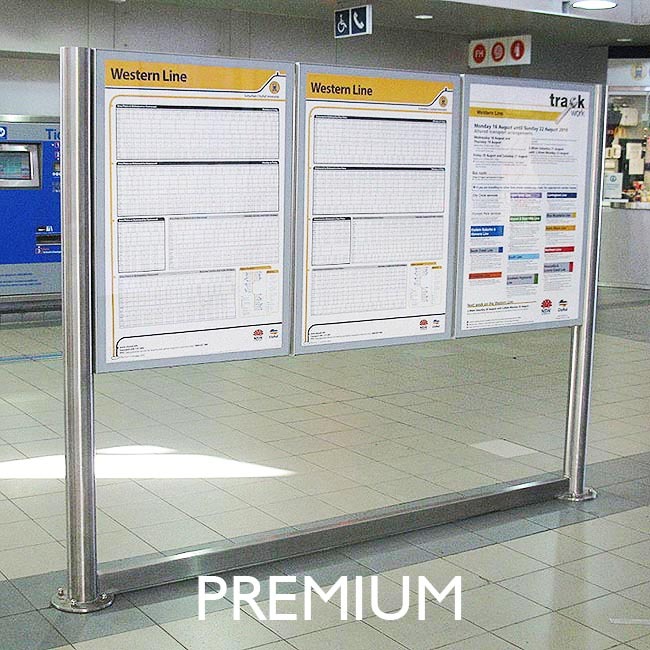 The Standard Frame comprises of two 3.0 metre Posts and three Cross Rails up to 2.34 metre each. All lengths are supplied pre made to suit the required size Sign Panel or Display Case. The posts have applicable location cleats fitted for easy on site assemble of the Cross Rails with the supplied tecscrews and mounting of the complete Display Case. This disassembled supply method is to save on handling and freight. Posts install allowance is for 2.4m above ground and standard is 0.6m below ground or alternative an upgrade option of Bolt Bases welded on. There is the optional upgrade to 100mm x 50mm x 2.5mm posts for higher wind, etc. demanding applications. Optional is a Sign Header Kit. It comprises of an extra pre made Cross Rail and 195mm high white sign panel with double sided tape attached for fitting to the frame on site. Optional vinyl graphics can also be attached to the sign. 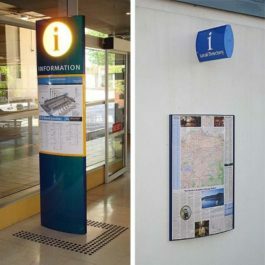 Customised shaped sign panels are also available. The galvanized Stands parts can be further all finished to a selected colour powder coat along with aluminium sign panel/s. This stand is complete fully welded, constructed from 316 marine grade Stainless Steel: 100mm dia posts, 50.8mm square and 100 x 50mm sections. The posts are positioned to the side of the case/s and sign with this model, are a maximum of 2.0m high and come with bolt bases. It can be supplied complete with display cases and or signs attached. On the back side of single sided displays is a sheet of 316 grade stainless steel attached with double sided tape. The finish is satin brushed /finished. 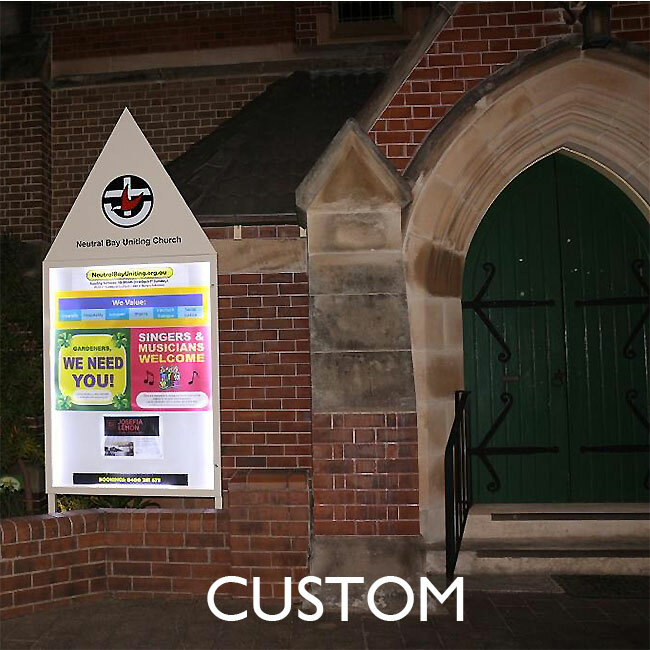 - Customised shaped sign panels are also available.